Have you had any insights into the roots causes of your anger? I believe that I have been numbing my mind with intoxicants to escape harsh realities and bad life decisions.Now without it as a crutch,I am experiencing the full effect and regrets of past actions and situations making my emotions volatile.Another issue is my memory is getting clearer now since I stopped drinking and smoking.Before this my memory was always hazy.Now it's getting clear and I am getting flashbacks of old memories,some 20 years old.The problem is I am mostly remembering negative memories that trigger anger,depression and extreme regret. So far no visible changes in how I feel.I still had 1 anger outburst recently.I daily do the breathing naam jap.5-15minutes.Before that I will soak feet in the salt water.I notice it dehydrates my skin,especially my palms that turn all wrinkly,but after a while it goes back to normal.Plan to carry on the feet soak till that bottle of Himalayan salt is finished.Will update again. Ok will do.I use hot water thats cooled down a bit,when I put my feet in its very hot and I have to go in and out of the water a few times until my feet can remain in the water with no burning sensation.I also do some visualization that black negative energy is draining out of my feet and mixing into the water. 3 tablespoons of salt in how much water(liters) do you recommend? Hello Veerji.Tried to pm you but you can't receive.Wanted to ask about the breathing naam jap.When I touch the tip of the tongue to the roof,do I need to apply pressure and push towards the roof or just a slight touch? You mentioned concentrate on each syllable separately but when I do that I notice I take 2 short breaths in instead of 1 long one. And do I take long breaths in and out slowly or just short ones faster? don't use that much hot water. just the warm water is enough. In regards to quantity of water, use enough water that covers your whole feet. I am assuming that you are using standard size bucket and not using bath tub. Moreover visualization is perfect but only when you know ALL ins and outs of it. 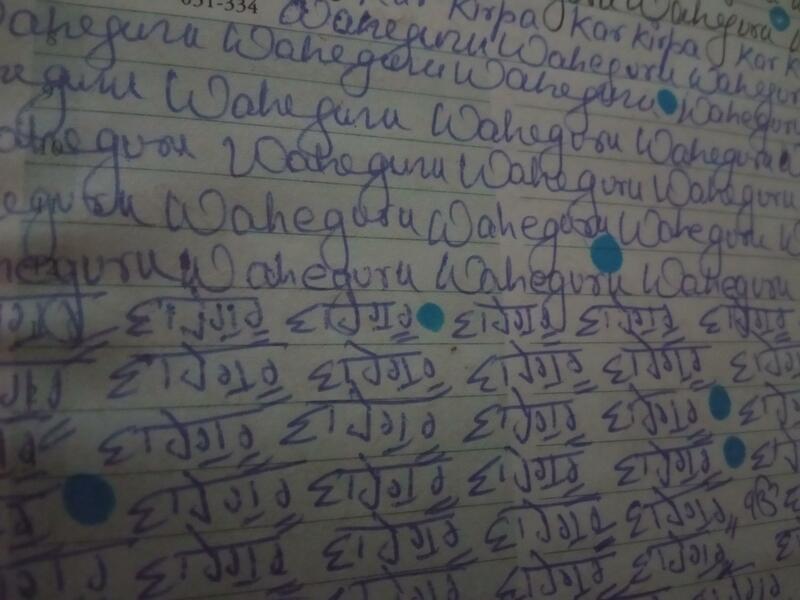 So, I would suggest without visualization as the starting point, may be just recite Waheguru during the soaking. Ok understood.Yes I use a standard bucket.Thank you Veerji. Veer ji my PM box is full right now. 1) The tongue should just slightly touch the roof, it should essentially just rest there - no significant pressure is applied. I'm going to tell you what works for me, and I think people adapt techniques to suit them. Remember that your lung capacity is very likely changing now that you've cut down/given up the fags. When I started simran, my breathing was very shallow at first, but this changed over time. I now go for long slow breathing. It might be a practice thing, so it might take you a little bit of sustained effort to get it? Maybe I misled you a bit, really if I think about it, the first two syllables (WAAAAAAAAHE) are one deep drawing in of air (through the nose). Now for the exhalation (which for me is the longest part), I slowly breath out to GUUUUUUUURRRUUUUUUUUUUUUU. When I get to the end I try and pause for a second again. This exhalation I repeat is much longer than the inhalation for some reason. The simran should help you (in time) to let go of the triggering thoughts. I've been getting flashbacks too of late. But I recognise them for what they are. I don't think I was mentally ready or mature enough to fully understand and deal with the past before. I think the repressed thoughts coming out now are a sign that you are finally ready to deal with them (not that it this is easy). Letting go and living in this moment onwards (easier said than done) is the biggest aid to overcoming regrets like you mention. It's wahegurus hukam. I have a clearer picture now.Will carry on and update in a week. 2nd update.There is improvement.Anger still comes almost everyday but I manage to do nothing and wait it out.Found a good tip by veer Bhagat Singh in the Meditation thread where he says to analyze the anger,its source,where I feel it in my body etc when it happens.It comes from the stomach area and spreads all over the torso.My mind starts making up stories and scenarios that fuel the anger.I start imagining scenarios that haven't happened and might never happen and this adds to the anger.It is like my mind provokes me to be angry and miserable and then laughs at me when I do get angry.So I just sit and endure the never ending thoughts and scenarios until I start thinking about something else.I try to chant Gurmantar to replace the thoughts but I seem to fail more often than not.The heat inside can be felt almost the whole day.I just try my best not to react to it.I have also been practicing the subtle art of keeping my mouth shut and so far the results have been forthcoming.I also suggest to myself that I should not make others around me miserable just because I am. Can't say much about the salt foot soak as I tried 3 tablespoons for a couple of days and ran out of H.salt.Have yet to buy more so can't update much on this. I do the breathing simran after JapjiSahib and Benti Chaupai daily.Usually lasts 5 to 15 minutes.Today I sat for 2-3 minutes and just got up and walked out of the room.I notice every time I try to do simran I start thinking I have something else important to do when I don't have anything else to do at that moment.I try to keep on breathing and saying Waheguru in my head as long as I can.Then I just start verbally reciting Gurmantar for a few minutes and end the session.I am going to have a shower and try doing simran again in a while.The good news is the days I manage to do simran properly for 15minutes I feel calm and content.Less negative thoughts. Will update again in a couple of weeks. Can't say much about the salt foot soak as I tried 3 tablespoons for a couple of days and ran out of H.salt.H﻿ave yet to buy more so can't update much on this. I'm sorry as it didn't help you. Please continue with whatever helps you. God bless you. try NOT to think about a thought that comes; just start thinking something else. e.g You're standing on the road watching the traffic, you see lot of cars going but you don't start thinking about each car and/or the person sitting inside. Same way, you your mind (road) will always have lot of cars (thoughts), the secret is NOT to entertain the thought and do NOT attach to your thought. Just watch and let it go; just like the same way we just watch the cars and don't get attached to what we saw. This is one of the tried and tested method as taught by various Saints. That letting go of the thoughts and not reacting to them, or letting them waft off into nothingness is a skill that gets better and better as you practice. You're already noticing a shift in the right direction, even if it is only a small one right now. Veer ji its really good that you are doing the jaap and are updating on here. I am glad that you have written this as it shows that how your changes are being felt via simran and you are developing awareness of yourself finally seeing yourself in a new light. Don't be sorry veerji.I haven't finished the experiment.Ran out of H.salt.Only tried the 3 tablespoons for 2 days and ran out.Will buy more the next time and try for longer. Ya I'm working on it.Now I realised thought control is everything.Thanks. Thanks.I trying to do this as much as I can although some thoughts do get through and I start getting lost in the stories and fantasies. Another thing wanted to ask you.When I do the breathing simran I tend to alternate it with either verbal simran or mental simran without the breathing.Is this OK? When you lose interest and focus do you still push yourself to do simran or do you stop and do it another time? Thank you for the support.I am reading old threads here and that helps a lot in understanding my situation.I am also trying to stop worrying and controlling events and accepting them as Hukam. What you are going through is completely normal. People call this 'Naam abyaas' or 'practicing naam'. It's something we develop and work on. It's just like physical training in that persistence and perseverance is key to progress. When you keep at it, you'll get to understand these psychological/spiritual things better and better gradually (sehajay). You also get infinitely more intune with your own internal self, and can choose to connect or disconnect to thoughts more easily. This helps big time with impulsiveness. Mixing between vocalised and internalised simran is fine at the beginning. A lot of people go through it in this way: (First) purely vocalised simran; (Second) a mixture of vocalised and internalised [like you are doing now]; (Third) purely internalised simran. Once I broke a long consistent chain of simran for some reason. When I got back to it, I found I had to go back to a mixture of vocalised and internalised to get back to purely internalised simran. I'd carry on. I'd say doing that under those circumstances is super important and may actually be one of the most beneficial things you can do. It's like trying to develop your physique but just giving up on training when you're not in the mood. You lose from this. It's those people that learn to push through that make the gains. When you persist even though you don't feel like doing the simran, you've won a major battle in itself. A part of this is taming the mind. And when you persist despite the munhs resistance to this - you've won another battle with your camel mind. Ok thanks for the explanation.Will push on and do as much as I can. When you do simran and try and tame the mind after a short while, I believe that the munh sort of realises what you are doing, and feeling threatened revolts against this to try and stop you. This is an important stage to reach. It actually means you're making significant progress. Keep at at, and take it to that next level brother. I don't know if thismay be helpful to somebody during simran but I used to have this 'thought thread issue' alot initially, though distractions still exist but.. It's all about the MIND after all. This concept of the mind control is called Sadhana and the one who achieves it is the Sadhoo. Thanks for the suggestion.Will try it out. I don't know about anger after paat. But the other day I was feeling vexed as heck, more than I usually ever do for no reason, then I did 15 minutes simran, and even though it was grappling with those thoughts that came up, by the time I finished I was in a completely different frame of mind. What I'm saying is that it definitely works. It might be that the length of time you do it for plays a big part in efficacy? Funny you mention it since I had the longest simran session few days back for about 30minutes and it was awesome. I just sat on a chair and started breathing in and out.Lights all off.Kept on doing it as long as I could and then on the lights and realized its been 30mins.